Please refer to our stock # 1175 when inquiring. Bright and Colorful Antique Korean Wedding Goose. A very charming work of Korean folk art. 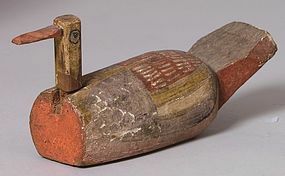 This painted wooden goose was a gift from a groom to a bride many years ago. Because geese mate for life, the goose was a symbol of the groom's lifelong commitment to his bride. 11.5 x 5.5 x 3.5 inches, 29.25 x 14 x 9 cm.